The remoteness of Norfolk is enabled by the way the long, slow determined rivers draw it up into self-contained areas, introspective and insular. It is often a job to remind yourself that we are, after all, barely 150 miles from central London. The rivers give Norfolk its character, and make it so different from soft, mystical Suffolk to the south. In the east of Norfolk the rivers form the Broads system, dividing the area into parts which are almost completely separate, apart from the handful of roads which connect them. The downside of this is that these roads are often very busy, particularly in late summer when the Broads holiday makers vie with the harvesting farmers, but if you are a cyclist I fear there is no alternative but to take them. Thus, to reach pretty Stokesby from Acle railway station you need to take the fast, dangerous Stalham road. The turn-off comes as something of a relief, and it was with great pleasure that, on one of those extraordinary hot days in April 2011, the temperature bobbing around the high seventies, I found myself pedalling away from all the madness into silence and birdsong. Stokesby, when you reach it, is delightful. The village is on the edge of the Flegg, at one time a proper island at the rivers' mouths, and peculiar in that its control in the 9th Century by Norse settlers appears to have been pretty complete. Virtually every placename around here takes a Viking form rather than a Saxon one. Stokesby reached its peak in the 18th Century, its particular character marked by the surprisingly large number of buildings of the time. Sitting as it does on the river, it must have been a busy place then, and the village green, almost surreally, lies beside the river, with the sails of boats a background to the children playing. There's a good pub, too. Within the heart of the village there is a good 20th Century Methodist chapel, now a private house, and a windmill, but for the medieval parish church we must cycle on through the village and out on the road to Runham (obviously once a slightly fearful Saxon outpost). Can there be any more idyllic setting in Norfolk for a churchyard than this one, set on a tree-surrounded rise looking out across its lovely village with the river beyond? In April the trees were not yet in full leaf, despite the heat, and the church appeared as a citadel above the ploughed fields, but in summer it must disappear completely. And imagine what it must be like to be here on a stormy autumn night, with the wind blowing all the way from Denmark! Like so many around here, St Andrew is basically a Norman church, but patched up and elaborated in a small way so much over the centuries that not much survives of its Norman origins. However, the whole piece is very picturesque. There was a big restoration in the late 1850s, when architects tended to be rather more enthusiastic than careful, so, thanks to the welcoming notice and the open door, you step into what is broadly speaking a typically rural Victorian church. However, there are plenty of earlier survivals, and the best of these are collected together at the west end, the very fine 15th Century bench ends. A woman in a headdress kneels at a prieu-dieu to say her prayers - if you look closely, you will see that her rosary is draped across the desk. There is a rugged cockatrice, a comical dragon and a very noble greyhound. If you left the south door open to more easily examine the bench ends, do take a look at the inside face of it when you close it, because there is a great curiosity, a semi-circular set of royal arms to Victoria set upon it. It seems very awkward, and cannot have been intended for its setting, unless of course it was made locally with materials to hand - could it have been painted on half of a barrel end? The other great survival here is the collection of brasses, some in the nave and some in the chancel. They date from the end of the 15th Century to the middle of the 16th Century, crossing the Reformation divide, and provide an instructive guide to both military and academic dress of the time. Several are to the Clere family. Set on the north side of the sanctuary is a beautifully worded mid-19th Century memorial, though in an earlier style, which records that it was placed to perpetuate for a few fleeting years the memory of William Taylor Worship. 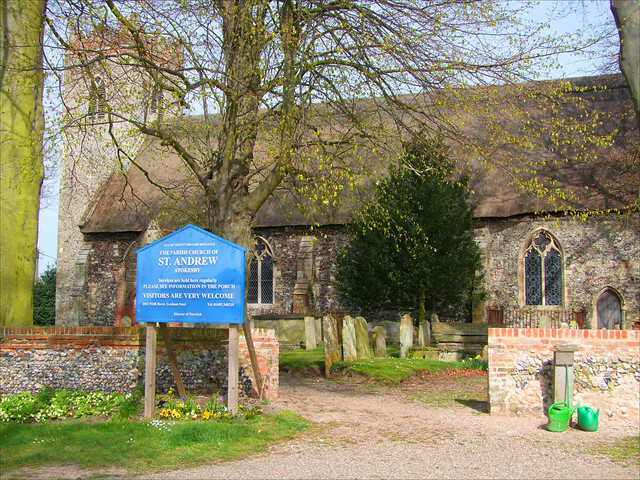 The aptly-named Worship was a clergyman at Beeston St Lawrence near Norwich and at Holton St Peter near Halesworth in Suffolk, but the days of his childhood were passed at the home of his father in the adjoining parish of Runham. The memorial does not say what caused his death, but it must have been something pretty bad, because what pain and the wasting sore have left of him is deposited with some of his nearest and dearest in a vault hard by. The 1840s was just at the beginning of the Catholic revival in the Church of England, and prayers for the dead were still anathema, of course; but Worship makes a special plea: Reader, offer, it may not be a prayer, at least a kind wish for the welfare of his soul. Amen to that.